The photo prompt for today is asking for a picture of nature. The extra task is to focus on strong leading lines. 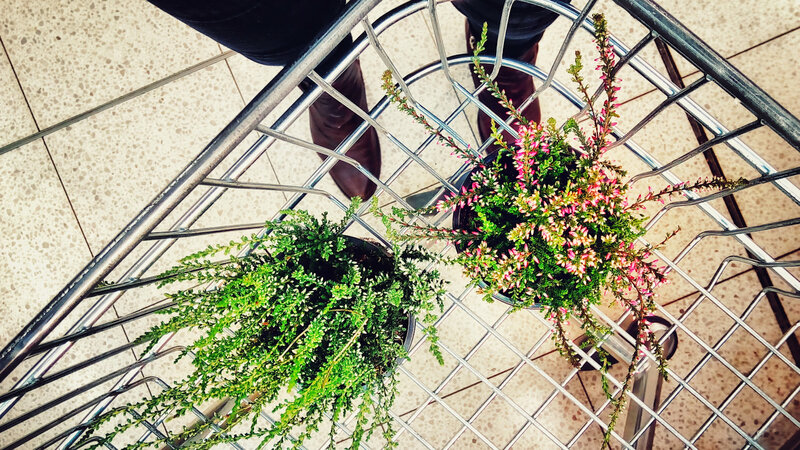 Nature photos are boring, so I took a snap of a bit of nature in the civilisation: my new heather plants. I tried to do something with the pattern of the shopping trolley and the floor. Like, make it into leading lines or what. Also, I’m kidding, I took this totally on random. Looks like nature to me. I ‘d be hard put to find variety in photo subjects. Leaves and grass and, soon, naked trees. The frame of cart structure’s s nice touch! Well, you nailed it ! And, randomly, I rather like it 🙂 🙂 Happy weekend! Thank you very much for your comment and since the weekend is over here, have yourself a lovely week! If possible.